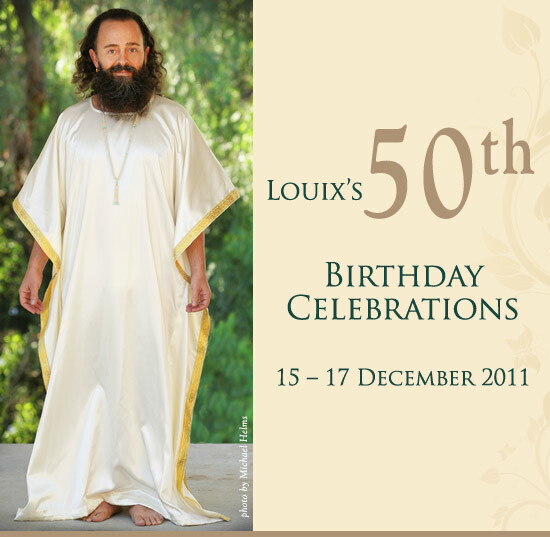 It is with great joy and excitement that we announce this year’s celebrations to honor the 50th birthday of Louix Dor Dempriey (Bhagavan Sri Pranananda)---a special and milestone year! Each year, disciples and devotees around the world hold a three-day celebration as an expression of our gratitude for His presence in our lives and on this planet, and to attune to His Divine energies that are available to all on this blessed day. Each year, Louix spends His birthday with His beloveds in a different part of the world. 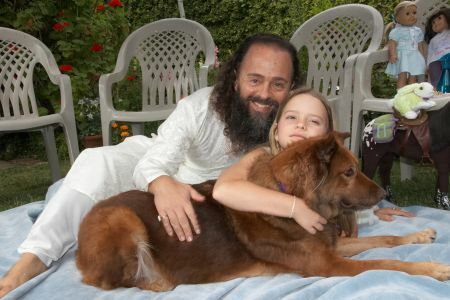 This year, Louix will shower upon us His love and personal blessing as He gives darshan in Encinitas, California. At the same time, His ashrams and study groups all over the world will host various events and gatherings, which all are welcome to attend. 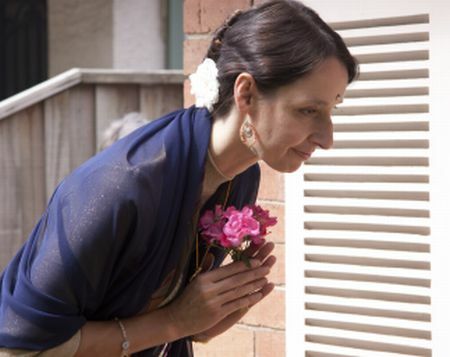 To begin each day of celebrations, Louix’s ashrams will perform an aarti ceremony. During these three days, many people also choose to fast or abstain from particular habits, as an act of devotion. 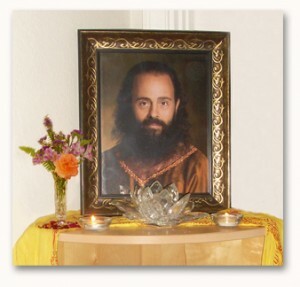 To help you commune with Him during this special time, we offer this free downloadable portrait of Guruji. "An act cannot bless one person without blessing everyone." 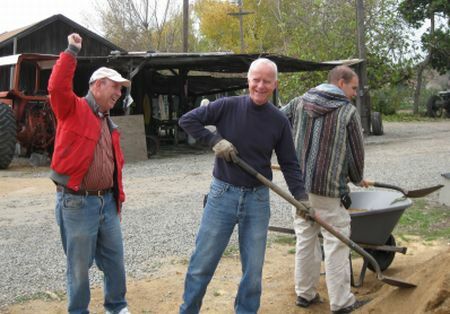 The first day of celebrations is traditionally a day of service (seva). Each year, a specific theme is chosen and acted upon by all of Louix's ashrams and centers. In order to maximize the impact of our seva upon the Earth, as well as synchronize as one global family, we recommend that your selfless service be consistent with the overall theme. For this year's birthday celebrations we will place our focus on "food donation," practicing generosity by extending our own abundance into the lives of others. On this day, the community of Prema Drala Ashram will holding a food drive that will directly benefit the disadvantaged people in our community (mostly seniors and children). We will be donating all of our collected foods to the Second Harvest Food Bank of Orange County (visit www.feedoc.org for more information). Our Foundation's mission of humanitarian service is reflected in the programs run by Second Harvest Food Bank. The second day of celebrations will consist of inward reflection upon the significance of having Louix's love and wisdom guiding our lives. On this day of introspection, we set aside time to rekindle gratitude in our hearts, and rediscover the joy and wonder it is to be on the path to liberation, walking with a God-realized being. Journaling our thoughts and reflections is also an excellent way of deepening these blessings. It is widely known that the two most powerful days to receive the darshan of a living Master are the day of His birth and the day of His liberation/enlightenment. We will be holding a very festive event that includes devotional singing, a vegan meal, and Louix graciously giving His darshan to all who attend. The event will be held at the Seaside Center for Spiritual Living in Encinitas, California (click here for more information about this event). His ashrams and study groups around the world will join the festivities with an evening of devotional singing, singing chants from various spiritual traditions, with most songs expressing devotion to the Guru. If you are unable to attend this event, you may celebrate by inviting friends and family to join in your own night of devotional singing or listening to your favorite uplifting music in His honor.